I periodically make comparisons of the United States and Europe that are not very flattering for our cousins across the Atlantic. Though this isn’t because of any animus toward Europe. Indeed, I always enjoy my visits. And some of America’s best (albeit eroding) features, such as rule of law and dignity of the individual, are a cultural inheritance from that continent. Nor am I trying to overstate America’s competitiveness, which actually has eroded considerably during this century. Instead, I’m simply trying to make the narrow point that too much government is already causing serious problems in Europe, and I’m worried those problems are spreading to the United States. Yet some of our statist friends, most notably Senator Bernie Sanders, think America should deliberately choose to be more like Europe. They have this halcyon vision that the average European is more prosperous and they exclaim that this is proof that a big welfare state is benign. Or perhaps even beneficial. So it was with great interest that I read a new article by Ryan McMaken of the Mises Institute. He takes a data-driven look at the America-v-Europe economic debate. The battle over the assumed success of European socialism continues. Many European countries like Sweden have gained a reputation as being very wealthy in spite of their highly regulated and taxed economies. From there, many assume that the rest of Europe is more or less similar, even if slightly poorer. But if we look more closely at the data, a very different picture emerges. Actually, I have a minor disagreement with the above passage. Countries like Sweden and Denmark are highly taxed, but it’s not true that they’re highly regulated. Or, to be more accurate, there almost surely is too much regulation in those nations, but since we’re discussing the relative economic performance of the United States and Europe, the relevant point is that there’s less government intervention in certain European countries (particularly Nordic nations) than there is in the United States. The only reason that they generally lag behind the United States in the overall rankings is that they have very bad fiscal policy and that more than offsets the advantage they generally have over America in other categories. Let’s focus on the main point of the article, which is an effort to produce a neutral comparison of living standards in European nations and American states. …if one is going to draw broad conclusions about poverty among various countries, GDP numbers are arguably not the best metric. For one, GDP per capita can be skewed upward by a small number of ultra-rich persons. …I thought it might be helpful to use data that relies on median income data instead, so as to better account for inequalities in income and to get a better picture of what the median resident’s purchasing power. McMaken uses OECD data to calculate relative levels of median income. The nationwide median income for the US is in red. To the left of the red column are other OECD countries, and to the right of the red bar are individual US states. These national-level comparisons take into account taxes, and include social benefits (e.g., “welfare” and state-subsidized health care) as income. 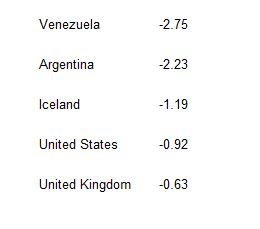 Purchasing power is adjusted to take differences in the cost of living in different countries into account. Since Sweden is held up as a sort of promised land by American socialists, let’s compare it first. We find that, if it were to join the US as a state, Sweden would be poorer than all but 12 states, with a median income of $27,167. And here’s the chart he described (click to enlarge). Remember, this is a look at the income of the median (rather than mean) household, so the numbers are not distorted by the presence of people like Bill Gates. Here’s some additional analysis based on his number-crunching. With the exception of Luxembourg ($38,502), Norway ($35,528), and Switzerland ($35,083), all countries shown would fail to rank as high-income states were they to become part of the United States. In fact, most would fare worse than Mississippi, the poorest state. For example, Mississippi has a higher median income ($23,017) than 18 countries measured here. The Czech Republic, Estonia, Greece, Hungary, Ireland, Italy, Japan, Korea, Poland, Portugal, Slovenia, Spain, and the United Kingdom all have median income levels below $23,000 and are thus below every single US state. …Germany, Europe’s economic powerhouse, has a median income ($25,528) level below all but 9 US states. We could stop at this point and declare that the United States was more economically prosperous than all European nations other that oil-rich Norway and the twin financial centers of Switzerland and Luxembourg. This doesn’t bode well for Bernie Sanders’ claim that America should be more like Sweden and Denmark. But McMaken expands upon his analysis and explains that the above numbers actually are too generous to Europeans. We’ve already accounted for cost of living at the national level (using PPP data), but the US is so much larger than all other countries compared here, we really need to consider the regional cost of living in the United States. Were we to calculate real incomes based on the cost of living in each state, we’d find that real purchasing power is even higher in many of the lower-income states than we see above. Using the BEA’s regional price parity index, we can take now account for the different cost of living in different states. And he produces a new graph, once again featuring the United States average in red, with other developed nations to the left and numbers for various states to the right. McMaken gives some added context to these new adjusted-for-cost-of-living numbers. …there’s less variation in the median income levels among the US states. That makes sense because many states with low median incomes also have a very low cost of living. …This has had the effect of giving us a more realistic view of the purchasing power of the median household in US states. It is also more helpful in comparing individual states to OECD members, many of which have much higher costs of living than places like the American south and midwest. Now that we recognize how inexpensive it is to live in places like Tennessee, Florida, and Kentucky, we find that residents in those states now have higher median incomes than Sweden (a place that’s 30% more expensive than the US) and most other OECD countries measured. And here’s the most powerful data from his article. 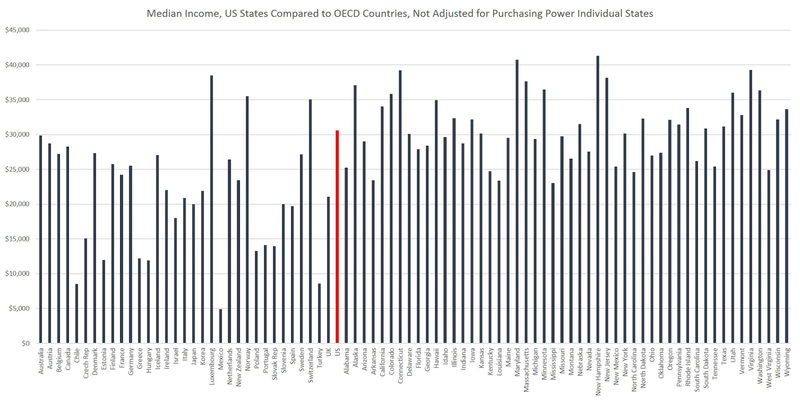 Once purchasing power among the US states is taken into account, we find that Sweden’s median income ($27,167) is higher than only six states… We find something similar when we look at Germany, but in Germany’s case, every single US state shows a higher median income than Germany. …None of this analysis should really surprise us. In other words, even when we limit the comparison to Europe’s more successful welfare states, the United States does better. Not because America is a hyper-free market jurisdiction like Hong Kong or Singapore. Instead, the U.S. does better simply because European nations deviate even further from the right recipe for prosperity. I commented on some of these issues in this interview with Dana Loesch of Blaze TV, specifically noting that living standards in Denmark and Sweden are below American levels. I also recycled my assertion that Bernie Sanders isn’t even a real socialist, at least if we’re relying on the technical economic definition of having the government own the means of production. P.S. In typically blunt yet analytically rigorous fashion, Thomas Sowell identifies where Obama belongs on the economic spectrum. Did alexander even read the article? That’s exactly what the first chart does, and even says it isn’t distorted by people like Bill Gates. Would everybody reading this article please look up the Gini Coefficient for me? It measures the income distribution within a country, and it might surprise you a bit. 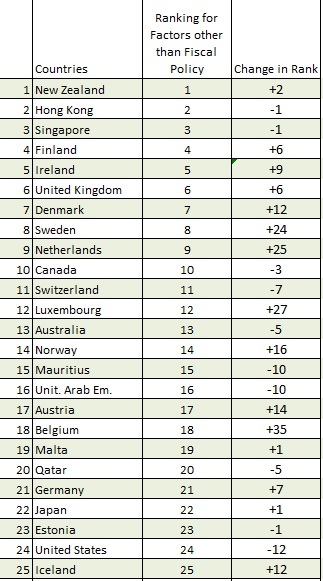 Denmark is way below the OECD average and way below the US. Denmark’s gini coefficient is 0.25. And what actually increases the gap between the US and the Nordic countries is that the gini coefficient does not take into account social security distribution and unemployment insurance, which historically has been much higher in the Nordics. I mean, come on. The minimum wage in Denmark is $17. And fun fact: Is’s not even set by the government. The conclusion in this article makes no sense. Comparing GDP per capita for a country (US) with a European country like Denmark is like comparing bananas and apples, when you argue for how wealthy the people in those countries are. The reason why the GDP per capita is higher in the US, is solely because you have a few very wealthy people driving up the average, while at the same time having a huge bunch of people barely making a living for themselves. On the other hand, you have Denmark with so much more economic equality compared to US standards. You can basically argue that there are no poor people in Denmark when you compare to the US. If you really want to compare how wealthy the people in the US are compared to any nation in the EU, you look at the income of the median citizen, and not at average GDP levels. The question basically comes down to: Do you want to live in a US state where the GDP per capita is higher ON AVERAGE, but where so many people cannot afford even the most basic stuff? Or do you want to live in a European country with lower GDP per capita ON AVERAGE, but where literally no one struggles to the same extent as some American citizens? Higher taxes necessarily drive up cost of living and drive down salaries. Example 1 (25% sales tax): A company with $1,000,000 in sales must have $750,000 in costs and profits, to pay the $250,000 in taxes. Example 2 (50% sales tax): That same company must increase prices by 50% to $1,500,000 in order to pay the $750,000 tax, if their costs and profits are $750,000. Obviously consumers are worse off in Example 2, if prices have gone up by 50%. However, it is unlikely that consumers can buy the same quantity of goods at the higher prices. To stay competitive, companies will try to lower costs, so salaries will be kept low and median incomes will suffer. Lose – lose. Liberals will argue that costs will go down in other government subsidized areas, but we all know that government overhead will take a big chunk. Perhaps Mr. Bernie Sanders and other pseudo-intellectual libs may want to think about comparing the national and/or public debts of each country??? Gee! Just because public-spending is higher, does NOT equate to greater prosperity! D’OH!! !